Looking for the perfect holiday gift? Give your family and friends the gift that keeps on giving, a DMF Youth Sponsorship! 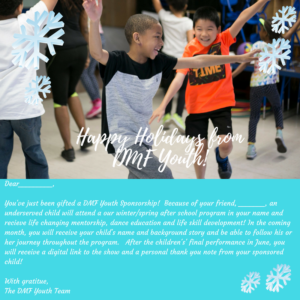 Your loved ones will receive the digital holiday card below, the story of their sponsored child, pictures and updates and AMAZING thank you notes from their child! Simply decide if you want a Platinum, Gold, Silver or Bronze Sponsorship, donate the appropriate amount and send us your loved one’s email and address! We’ll do the rest! Platinum: A $500 Platinum Sponsorship supports one child through the entire 22-week winter/spring semester. 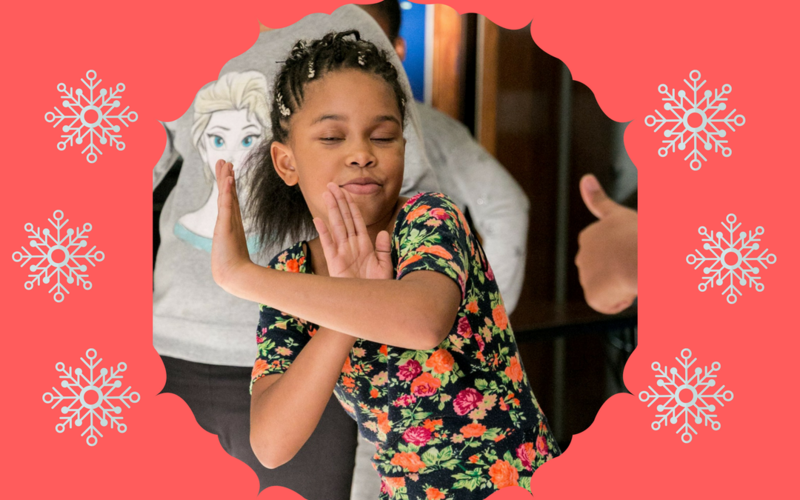 This includes twice a week, three-hour classes, one-on-one mentorship, all snacks, arts and craft materials, and costume for the final performance. Gold: A $250 Gold Sponsorship supports one child through half of the 22-week winter/spring after school program. This includes journals, water bottles, and costume for the final performance. Silver: A $100 Silver Sponsorship provides one child 22 weeks of snacks, arts and craft supplies, and costume for the final performance. Bronze: A $50 Bronze Sponsorship supports one child through one month of afterschool programming. Your sponsorship gifts greatly impact the lives of so many underserved youth and give them the much needed love, mentorship, and life skills they need to thrive! Thank you for your support! Click HERE to donate a sponsorship!